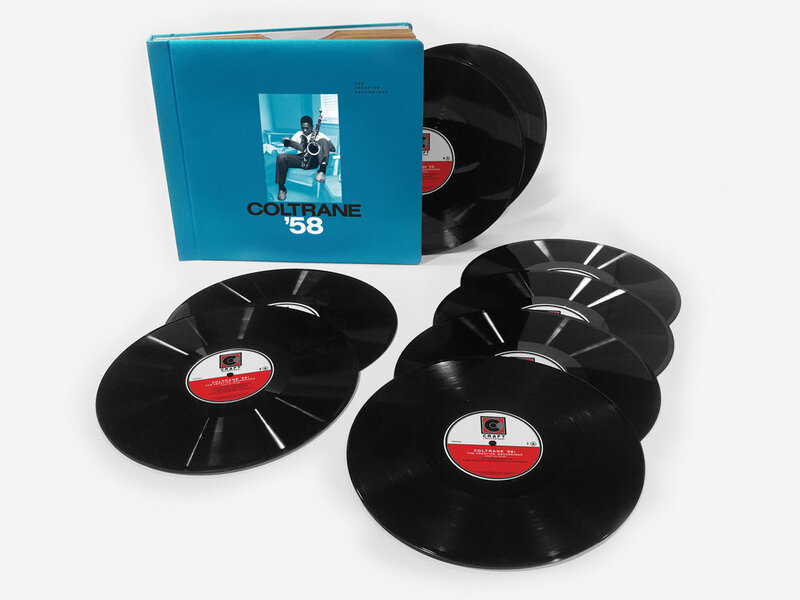 The timely release of Coltrane ’58 marks the 70th year since the founding of Prestige Records and comes just after the 60thanniversary of these recordings. It also follows on last year’s successful release of Both Directions at Once, which debuted at No. 21 on the Billboard 200, the highest chart position of his career. In 1958 Coltrane was still two years away from emerging as a bandleader, but his membership in ensembles led by Miles Davis and Thelonious Monk had propelled him into the spotlight as one of jazz’s most exciting and controversial figures.Coltrane ’58 serves as a window onto the shock and awe—and eventually deep appreciation—Coltrane generated during this period, when his sheets of sound approach pushed the bebop ideal of slaloming through a tune’s chordal pathways to its extreme. Coltrane ’58 reveals other significant aspects of Coltrane’s emergence, too, like his growing status in the hard bop brotherhood of the day. He recorded with contemporaries (many future legends in their own right), including pianist Red Garland; guitarist Kenny Burrell; trumpeters Donald Byrd, Freddie Hubbard and Wilbur Harden; bassist Paul Chambersand drummers Art Taylor, Jimmy Cobb and Louis Hayes. The sessions all took place in Rudy Van Gelder’s legendary home studio in Hackensack, New Jersey, where so much of the best jazz of that era was recorded. Coltrane’s music of 1958 benefits from a marked blue-collar, pressure-cooker aesthetic: Born in three-hour sessions with minimal rehearsal, head arrangements and mostly first takes, these tracks provide a true and transparent view of the talent Coltrane was able to draw upon and the timeless, improvised magic they created together. Gary Burton’s legacy is an estimable one, a wealth of riches traversing the boundaries of genre, style, nation or generation. It’s nearly impossible to summarize such an adventurous career, but Take Another Look: A Career Retrospective offers a stunning and well-curated overview in 35 tracks over five 180-gram vinyl LPs – including one previously unreleased offering from his New Quartet, a rendition of Pat Metheny’s “Elucidation” from 2005. The included booklet features rare photos, ephemera and insightful liner notes by Neil Tesser: critic, radio host, GRAMMY®-winning author, and editor of Gary Burton’s acclaimed autobiography Learning To Listen (Berklee Press, 2013). The collaborators represented on Take Another Look are a staggering array of marquee names from the jazz world and beyond: icons like Chick Corea, Keith Jarrett, Jim Hall, Roy Haynes, Steve Lacy, Michael Brecker, Carla Bley, Steve Swallow, Dave Holland, Stéphane Grappelli, tango master Astor Piazzolla and pioneering soul drummer Bernard Purdie; genre-blurring fusion greats including Bob James, Peter Erskine, and Will Lee; Burton discoveries-turned-jazz-giants such as John Scofield, Larry Coryell, Pat Metheny, and Julian Lage; ECM staples Ralph Towner, Eberhard Weber, and Wolfgang Muthspiel; and countless others. Available at all fine vinyl and digital retailers. On February 16, Craft Recordings will release a deluxe edition of one of the most iconic and enduring records in jazz. Celebrating the 60th anniversary of the recording session in 2017 and the 60th anniversary of the first stereo release of the album in 2018, Way Out West, alongside Saxophone Colossus, cements Sonny Rollins’ status as one of the top tenor saxophonists of all-time. This meticulously compiled package pays appropriate tribute to the importance of the landmark recording with an audiophile-quality pressing of the original album and a second LP of bonus material featuring rare and previously unreleased tracks from the legendary 3 A.M. session with bassist Ray Brown and drummer Shelly Manne. Both records are pressed at Quality Record Pressings (QRP) on 180-gram vinyl from lacquers cut by George Horn at Fantasy Studios. GRAMMY® Award-winning writer Neil Tesser contributes liner notes, which include excerpts from a recent interview he conducted with Rollins especially for this release. Rare photos by famed jazz photographer William Claxton round out the collection, which comes housed in a handsome, hinged box. More info below on the album and Rollins. Way Out West (Deluxe Edition) will also be available at streaming outlets, mastered for iTunes, and in Hi-Res digital (96/24 and 192/24) on street date. Pre-order Way Out West (Deluxe Edition) on Amazon. Compilation/Reissue Produced by Nick Phillips. Released 12/15/17. Los Angeles, Calif – Craft Recordings, the Catalog Division of Concord Music is proud to announce the release of Thelonious Monk’s The Complete Prestige 10-Inch LP Collection. 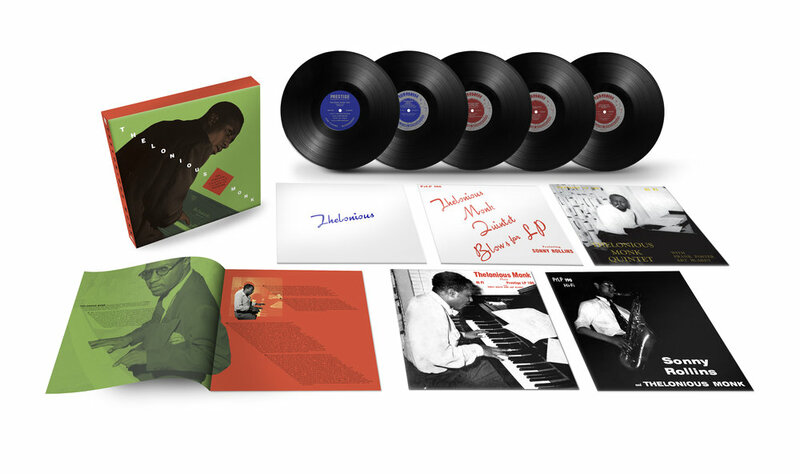 Released on December 15th, the limited-edition box set includes all five of the 10” vinyl LPs which the pianist recorded for the jazz label, spanning 1952 to 1954. Each album has been faithfully reproduced – from the jacket design to the LP labels – while the audio has been carefully restored and remastered by Joe Tarantino from the original analog tapes, with lacquer cutting by George Horn and Anne-Marie Seunram at Fantasy Studios. Rounding out the collection is a booklet with new liner notes by Robin D. G. Kelley, author of Thelonious Monk: The Life and Times of an American Original. The Complete Prestige 10-Inch LP Collection will also be released in high-res and standard audio formats across all streaming and digital platforms. "...a high point in the piano icon's acclaimed career." Produced by Nick Phillips. Released May 13, 2016. The Complete Prestige 10-Inch LP Collection presents all ten 10-inch LPs on which Miles Davis appeared as a leader for Prestige Records, plus a bonus record featuring Davis as a guest artist withLee Konitz, all remastered from the original analog master tapes and faithfully reproduced on 10-inch vinyl, including the original cover artwork and liner notes. Also in the box is a 16-page booklet featuring rare photographs and insightful new notes byGRAMMY® Award-winning author Ashley Kahn, as well as a collectible print of a painting by Davis. The complete list of albums includes: Modern Jazz Trumpets (featuring Dizzy Gillespie, Kenny Dorham and Fats Navarro); The New Sounds;Blue Period; Miles Davis Plays the Compositions of Al Cohn; Miles Davis Quartet; Miles Davis All Star Sextet; Miles Davis Quintet; Miles Davis with Sonny Rollins; Miles Davis All Stars, Vol. 1; Miles Davis All Stars, Vol. 2 and, as a bonus, Lee Konitz’s The New Sounds, featuring Davis as a guest artist. These records offer an incredible lineup of talent, including performances by Art Blakey, Al Cohn, Roy Haynes, Percy Heath, Milt Jackson, Charles Mingus, Thelonious Monk, Max Roach, Sonny Rollins, Horace Silver and Zoot Sims, among many other legends of the genre. Produced by Nick Phillips. Released April 22, 2016. LOS ANGELES, Calif. — On April 22nd, 2016, Concord Records released The Vinyl LP Collection: a limited-edition, individually numbered box set celebrating a key period in the prolific solo career of renowned guitarist Lee Ritenour. The Collection contains five classic LPs by Ritenour: Earth Run (1986), Portrait (1987), Festival (1988), Color Rit (1989) and, on vinyl for the first time, the GRAMMY® Award-nominated Wes Bound (1993). These albums have each been remastered, pressed on audiophile-quality, 180-gram vinyl and restored with original artwork and liner notes. An accompanying 46-page booklet contains new liner notes by Ritenour plus never-before-seen photos and ephemera, all culled from an extensive scrapbook collection lovingly kept by the guitarist’s late father. The Vinyl LP Collection presents a fertile period in a storied career, which began at the age of 16, when Ritenour was hired as a session guitarist for the Mamas and the Papas, who dubbed him “Captain Fingers” for demonstrating incredible dexterity. Throughout the next decade, Ritenour became one of the most prolific session guitarists, working with the likes of Steely Dan, Pink Floyd, Aretha Franklin, Tony Bennett and Quincy Jones. Ritenour’s solo work has earned him a GRAMMY® Award and 19 GRAMMY® nominations. He has recorded more than 40 albums that have yielded 35 charting tracks, and he is widely recognized as one of the best guitarists of his generation. “For us music lovers and folks who play music, vinyl is still the most amazing way to listen to and appreciate music,” proclaims Ritenour in his liner notes. “I'm thrilled that Concord Records and myself can present these five records remastered on 180-gram vinyl.” The Vinyl LP Collectionincludes such personnel as Academy Award-winning composer Dave Grusin, GRAMMY® Award-winning pianist Alan Broadbent, and GRAMMY® Award-winning composer David Foster, plus legendary saxophonist Kenny G and celebrated Brazilian artist Caetano Veloso.